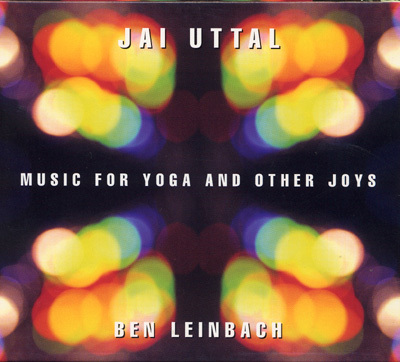 Grammy® nominated world music pioneer Jai Uttal, and multitalented producer/instrumentalist Ben Leinbach offer a moving mix of melody, rhythm, texture, and chant on Music for Yoga and Other Joys. Known for their eclectic blend of Eastern and Western sounds, Jai and Ben have produced their first CD specifically designed to accompany your yoga practice as it joyfully permeates every aspect of life. Featuring dotar, electric guitar, slide tamboura, banjo, bansuri, and Jai's passionate singing, Music for Yoga and Other Joys will take you on a gentle journey into the mysterious ocean of Spirit. Well known in the world music community, Jai Uttal's musical roots embrace a rich variety of cultures and traditions that span the globe and the centuries. From the hillbilly music of the Appalachian mountains to the passionate strains of Bengali street singers; from the haunting rhythms and melodies of ancient India to contemporary electronic experimentation, Jai's music distills the essence of diverse musical forms. Ben Leinbach is a producer, engineer, composer, and multi-instrumentalist. He has been making records with Jai Uttal for over a decade. His production and engineering work spans the musical spectrum from world music to rap, from pop to salsa. He also is a gigging jazz and rock drummer.